Edward the Third stands in the burnt ruin of an English church. He is beset on all sides. He needs a victory against the French to rescue his Kingship. Or he will die trying. Philip of Valois can put 50,000 men in the field. He has sent his priests to summon the very Angels themselves to fight for France. Edward could call on God for aid but he is an usurper. What if God truly is on the side of the French? But for a price, Edward could open the gates of Hell and take an unholy war to France . . .
Mark Alder has brought the epic fantasy of George R.R. Martin to the vivid historical adventure of Bernard Cornwell and has a created a fantasy that will sweep you to a new vision of the Hundred Years War. Expertly written, highly detailed, and vividly imagined, this is an outstanding work of historical fiction/alternate history which pulled me in with its prose and story from page 1. Even at 700 pages, I did not feel it was too long, rather I was sad for it to end because I wanted more. For those that follow my reviews, you know I prefer books on the short side but this was so fun and so epic that I don't think it would have been the same shorter. I did not plan on reviewing this however it was so good I want to say a few words about it. Being only very vaguely familiar with the time period in which the story takes place (The Hundred Years war from 1337-1453 between England and France), I wasn't overly interested in reading this. 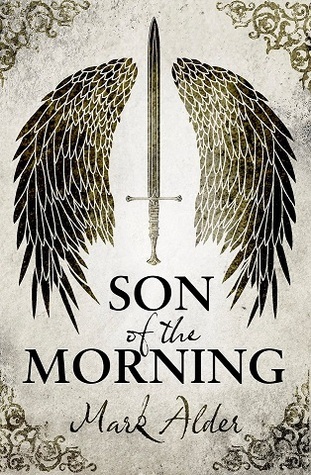 It was on my radar but until I saw Mark Lawrence mention how beautiful the prose was I still wasn't sold. Mark, my favorite author, has never let me down on a recommendation so I decided to move on this book sooner rather than later even though my TBR pile is insane right now. This is one of the best books this year, and probably in my top 10 of all time. It takes the story of Christianity, of which I am a believer, and turns it on its head. I don't get the impression the author is malicious in his take on the history of Christianity but certainly there are some who would not be able to handle a work that so twists what they believe. For me, the story the author tells is incredibly thought provoking, causing me to think about religion, history, warfare, and philosophy in new ways. 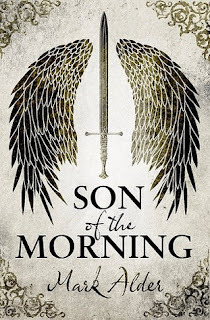 Son of the Morning is overflowing with sorcerers and magicians, devils, demons, angels, fallen angels, imps as "familiars", saints, Watchers(Nephilim),and includes Satan, Lucifer, and God all interacting with a huge cast of priests, kings, queens, princes, mercenaries, generals and other characters from both France and England. Knights Templars and Hospitallers also make appearances and are very important to the story. Wildly imagined and often horrifying demons and devils are released from Hell as its doors are opened and closed using magic circles and relics from saints and angels. There are relics galore, all being fought over and searched for across the continents, and as I am a huge fan of relics this alone is a huge attraction to me. There is tons of political intrigue and warfare which includes a naval battle as well as sieges and ground warfare. The plot is complex and multi-layered and at times overwhelming to follow but well worth the effort. I read this as more of a plot based book rather than a book focusing on getting to know the characters. The character building was very good and I enjoyed many of them. However, because of the constant action and introduction to new characters it just seemed like the plot and action was what fueled my obsession with this book (as well as the wonderful writing and imagination). This is a dark book, set during a dark time. There are really no "good guys" and for me I did not know who to root for, which is a crazy feeling while reading. This is a time period of epic civil unrest and church dogma and its very fascinating to see how these elements play out on a large and small scale. Disease and violence are parts of everyday life and the writing brings us to that time. It was very atmospheric; I felt like I was there. I have about 50 pages left in the book. I will be very sad when I finish and I don't know how another book will live up to the standard set here. But I felt that way before and I have some great looking books coming up. No matter how this ends, I can't wait to go back to this series and I pray that the next is released soon. This book comes with the highest possible recommendation. I just don't see how someone could not like this book. It's so unique and I have never read anything like it. If you are looking for a book to get lost in and unlike anything you have ever read, try this.